Workshops 2019 will offer a variety of ideas and techniques for everyone from the novice to the experienced! Workshop registration will be opened 4 months before each session. To confirm your spot in a workshop payment must be included at the time of sign up. Cost of each workshop is $40 with checks made payable to SRQG. Information regarding each workshop and the supply list will be posted on the website. Ccontact Janice Rodgers at jrodgers@sonic.net for future information. November 22 NO WORKSHOP There will be a free sewing day! Inger started at an early age, helping her mother support the family by sewing doll clothes for a nearby toy factory. From an early age, Inger demonstrated a creative flair and an excellent aptitude for art. Inger’s mother Mary was skilled in the “old world” thread arts of knitting and embroidery. Inger went on at an early age to self-teach herself tatting, and crocheting, after mastering knitting and embroidery. Inger was a member of the American Embroidery Guild of San Francisco in the 1980s. In her spare time, Inger continued to branch out and learn different fiber art/mixed media forms, adding spinning and dying yarns, silk dying and glass bead work. 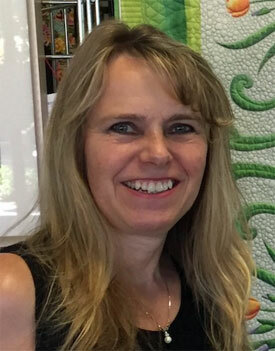 In the first ten years after moving to El Dorado County, Inger completed numerous embroidery and home spun knitted projects which she successfully competed and won critical acclaim. 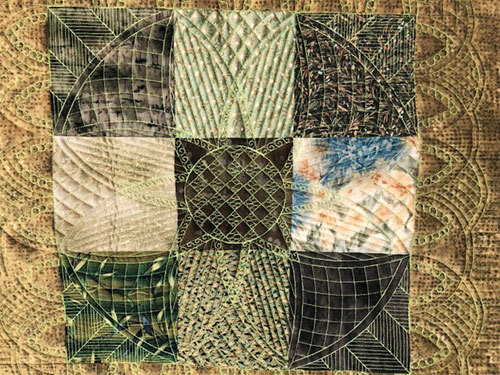 In 1997 Inger narrowed her creative focus and immersed herself primarily in patchwork and quilting Inger managed to create and produce many beautiful and award winning quilts. 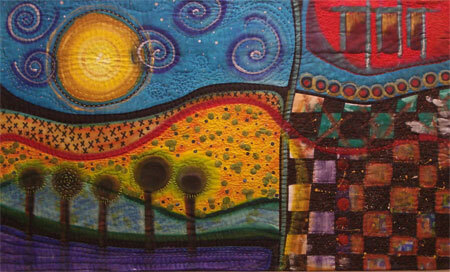 Having nearly shunned most other fiber art forms, Inger is singularly passionate about quilting. Inger continues to produce original quilt art pieces which have been Juried in, won and displayed at Regional and National quilt shows. 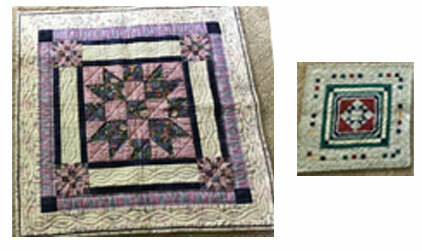 This is a Trunk Show with over 40 quilts and garments demonstrating Inger’s progression from beginner to expert. The show will include quilts and garments that have won awards at PIQF, Road to California, AQS and HMQS shows as well as the California State Fair and the El Dorado County Fair. Inger will show machine work from her early days 50 years go. Topics of discussion will include the vast improvement of using a well tuned machine with the correct needle, thread and tension. Additionally, the techniques and advantages of finish blocking will be discussed. An accomplished quilter, Inger, will teach this class, demonstrating all necessary steps of the process. Hands on instruction for using rulers. Learn how to lay out a grid to complete your design. A variety of designs will be discussed, including crosshatching and curved crosshatching using straight and circular rulers. All on your domestic sewing machine! Join me in a meaningful and lighthearted look at the creative process, creative blocks and effective tools for mastering creative momentum. Audience members will leave feeling validated, courageous and ready to follow the white rabbit to creative adventure! Participants make small whole cloth paintings, learning to use different materials for making marks on fabric. Color theory and the principles of design will be a big part of this experience, as will my special theory of “embrace the blob”. We will discuss creativity theories, blocks and useful techniques to push ourselves closer to the creative bliss. I provide all supplies for your use. You just bring a plain shirt and your imagination! Dora Cary was born in Romania, a beautiful country situated in Eastern Europe. Her mother and grandmothers taught her to sew, knit, embroider, crochet, and weave from a very early age. She loved it all! Most of her life in Romania was lived under a strict communist regime but that taught her to appreciate freedom more and be creative about finding ways to achieve what she wasn't allowed to have. Dora studied engineering and, after witnessing a revolution (that overthrew communism in her country) and getting her degree, she went back to school to learn about marketing and design in a free economy. In the late 90's Dora met an American man who later was to become her husband. After moving to the United States in 2001 she stumbled onto quilting in 2006, it was something new to her as there is no quilting in Romania. It was love at first sight and she could not stop thinking about this amazing art form. She has been making quilts ever since. Dora started quilting by using available patterns but very soon she was creating patterns of her own. Encouraged by the oohs and aahs of the ladies in the local guild, she decided to share her creations with the world. 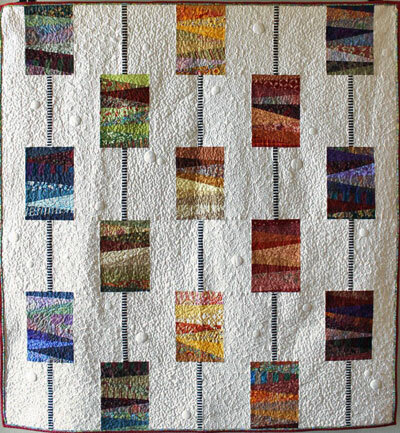 Dor’s quilts have a contemporary look but she loved traditional patterns and tried to reinterpret them in a new way. 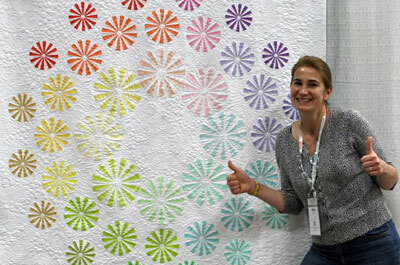 Dora’s quilts have been displayed in many quilt shows such as QuiltCon; QuiltFest Oasis in Palm Springs; Seven Sisters; and Pacific International Quilt Festival. 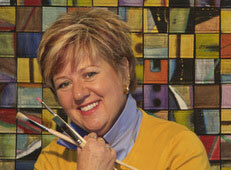 Dora will talk about the art of Fearless Quilting. She is very energetic and will keep you entertained. 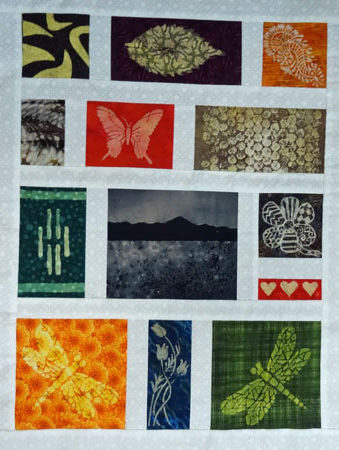 This trunk show concentrates on a collection of small quilts which have been made with blocks, strip sets, or fabrics that were either "left" from other projects or made to reduce a fabric stash. Many examples include "Parent and Descendant" sets. This workshop is designed to help the student become more comfortable and familiar with re-sizing traditional pieced blocks, as well as precision cutting and piecing. 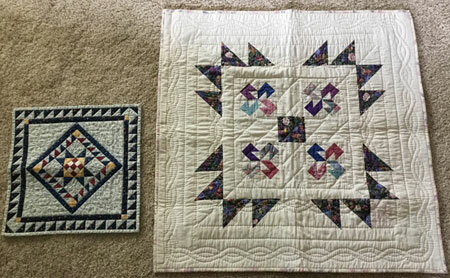 She will begin with designing simple blocks on graph paper and then progress to cutting and sewing 3-1/2 inch unfinished, 4 inch finished, and nine-patches, including half-square, quarter-square triangles and magic corners. This is a technique, rather than a project-oriented workshop, which does not involve templates or paper-piecing. She will discuss possible uses for our small treasures. The completed small-scale blocks are perfect for incorporating into "Wearable Art" projects or accents in quilts. Also they make wonderful labels! Or you could start your own Crumb Box Treats! I (Mary Wood) recently had the opportunity to chat with her about the upcoming visit to our guild. She is excited to be with us. Colleen is an amazing quilter! She is going to bring some quilts to show that will leave you in awe! Her program is "Life With A Border Around It." She starts with a few quilts made by her great-grandmother, grandmother, and mom, and then moves on to her own quilting and designing journey. 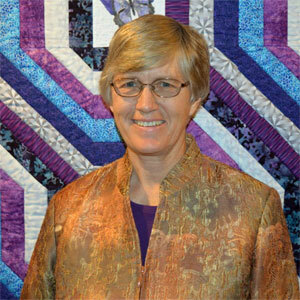 As she shares her quilts, she will also share stories about her quilts or stories that inspired her quilts. Don't be surprised if she throws in a quilting song or two! This workshop is hands-on. No need to bring your sewing machine (unless you want to). Colleen starts with a little show and tell of quilts she has made using discharge paste in the design process. She will teach us a variety of techniques for using discharge paste on fabric and demonstrates how to use all of the different tools she has acquired. THEN, you get to play with her toys and Colleen will give you any assistance you might need or want for the rest of the day. She provides ALL the tools and the discharge paste. All you need to bring are pieces of fabric you would like to try the discharge paste on. You will be taking home a small container of the paste so you can continue playing and experimenting at home.